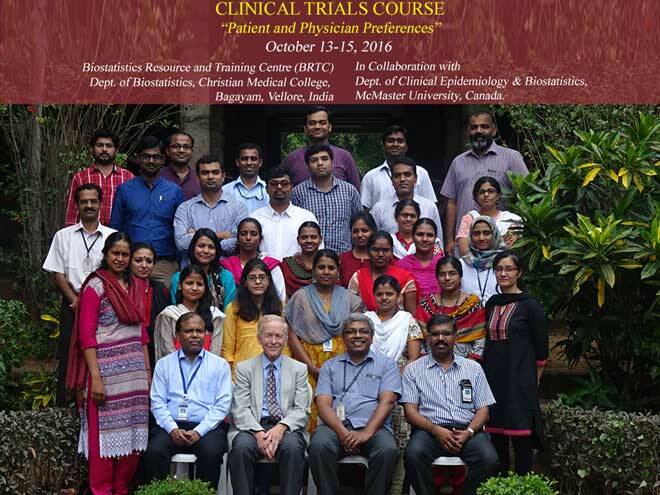 Clinical Trials Course (Patient and Physician Preferences) - Collaboration with Department of Clinical Epidemiology & Biostatistics, McMaster University, Canada. This course provides thorough knowledge in the principles and practice of clinical trials to study the effect of an intervention on health outcomes with the special focus to incorporating patient and physicians preferences in the treatment allocation. This will include lectures, practical, participant’s presentation, and group work. To impart knowledge in principles and practices of controlled clinical trials with the special focus on incorporating patients and physicians preferences in the treatment allocation, through lectures and practicals. To impart the basic concepts in Ethical issues in research, and Journal critique. To discuss and clarify the methodological challenges in the planning, conduct and analyses of a trial such preferences. This course is tailored to researchers working in Pharmaceutical Industries, medical, allied health professionals, nonmedical faculty and researchers actively involved in trials, or teaching or in furthering their knowledge and skills in methodology (to update their skills in recent developments in design and analyses). Course Fee should be paid in full by October 06, 2016. Payment can be made by Demand Draft in favour of “Christian Medical College Vellore Association Account“, payable at Vellore. Course fees will not be refunded once the payment is done. Participants will have to bear their own expenses for travel, boarding and lodging. The Organizers will give Course kit, Lunch and Snacks. However the organizers may arrange basic accommodation with A/C facility in the college campus on request. Only limited accommodation is available on campus and priority will be given to the female participants. The number of participants: limited to 45 admissions will be purely on first come first served basis. More detailed examination of the two stage designs. The expertise-based design. Implementation and efficiency issues; defining expertise.